This is a media converter that converts a 10/100Base-TX(RJ-45) to 100Base-LX(SC) via a 1310nm single-mode fiber (SMF) SC connector, which allows distance reach up to 20km. This provides a cost effective conversion from 10/100Base-TX(RJ-45) to 100Base-LX fiber, while extending the network reach beyond the 100m reach limitation of copper. 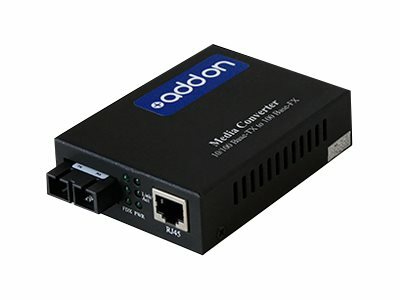 This product series of media converters allows two types of network segments to be connected easily. The DC/DC powered PoE media converter is a powered device (PD) that complies with IEEE802.3af standard, which combines data transferred over a fiber optic link with a DC/DC converter, accepting power from IEE802.3af Power Sourcing Equipment (PSE) over CAT5 and up UTP cable (cable length up to 100 meters/330 feet). Our media converters and network interface cards are 100% compliant for all of our networking needs. Now you have a cost effective solution for all of your network upgrade needs.